Increases Strength, Estrogen Blocker & Enhanced Libido! 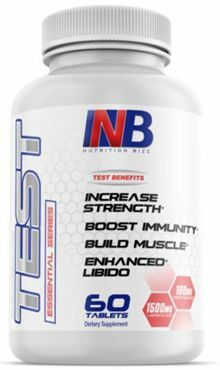 TEST contains the highest quality ingredients based on sports nutrition research to deliver top notch results. Featuring full dosages of L-Aspartic Acid, Tribulus Terrestris Extract, Fenugreek Seed Extract & Diinodolymethane, Nutrition Bizz TEST plays roles in increasing muscle definition, boosting immunity, increasingstrength, and enhacing male libido.